I love great picture books. I love rhyming picture books when they're done very, very well. I love quirky illustrations. 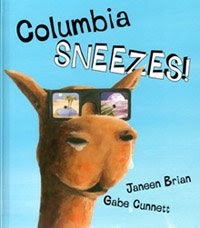 I love boy camels called Columbia. I like all the palms and the watery wells. I like all the moonlight and fresh nightly smells. Atishoo, I sneeze and atishoo again. Can't you just see delighted kids loudly joining in with that sneezy refrain? Soon poor Columbia's problem had me laughing aloud. Perhaps that doesn't say much for my compassion, but I defy anyone to read this riotous romp of a picture book without a chuckle or two. I've enjoyed other books written by this talented Australian author (Oddball, Where does Thursday go? and Elephant Mountain), but Columbia Sneezes takes its place at the very top of my list. Gabe Cunnett's illustrations were created from acrylic paint on paper, Adobe Photoshop, and a wacom tablet. They add a whole extra dimension to Brian's rhyming tale. I swear the desert traveller on stilts whom Columbia meets, is modelled on the Jawas from Star Wars IV. As for Columbia's hump? Let's just say Cunnett is an illustrator with a great sense of humour. Can you guess the title of my new favourite picture book? Coming next week, Share a Story - Shape a Future, a blog literacy tour.